Skinless chicken breast meat is so wonderful to cook with, since there are myriad of ways to prepare it, while keeping it low-fat and healthful. This recipe would easily fit into the Fat Smash Diet menu, as well as Weight Watchers, and I am sure for many others. I am not a big fan of cooking with lemons, being of Eastern European descent, but since this recipe received high scores from my family, I was quite pleased as well. Set up a shallow plate with flour seasoned with salt, pepper and Parmesan Cheese. Set up another plate with beaten eggs with 1 Tbsp. of water. Heat up a frying pan with 2 Tbsp. of oil, on medium high heat. Dredge each chicken breast piece in the flour mixture, to coat lightly, but evenly. Dip the floured chicken piece in the egg wash, dripping off any excess eggs mixture. Place the chicken piece in the pan and fry it to a golden color, about 3 minutes per side. Once cooked through, remove from the pan and place it on double thickness of paper towel to absorb any excess oil. Place the fried chicken pieces in a casserole dish, covered with foil paper to keep warm. You may keep it in the warm oven. Add more oil to the pan, if needed, and repeat the above process until all chicken is used up. Drain off and discard any remaining oil from the pan. Add the wines, lemon juice, and broth to the pan, and cook to deglaze it, stirring continuously. Add the butter, parsley, paprika, salt and pepper. Bring to boil, and simmer for 2 minutes. Dissolve the corn starch in a teaspoon of water, add to the sauce, and continue to simmer until slightly thickened. Pour the sauce over the warm chicken, turning once to evenly coat the pieces. 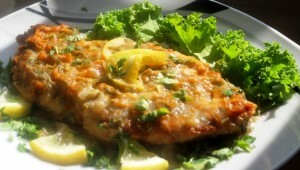 Pour some of the sauce over the top of each piece, and garnish with thin slices of lemon, and chopped fresh parsley.